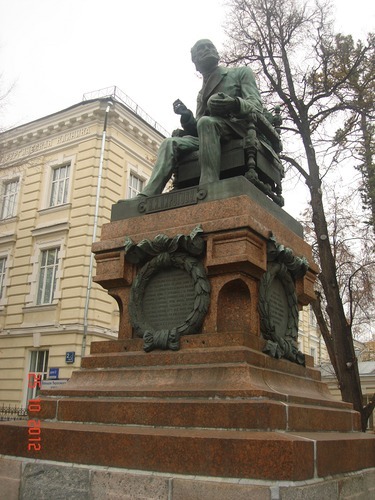 This bronze monument of Nikolay Pirogov can be found in Moscow (Bol'shaya Pirogovskaya, 2). It was sculpted by prominent academic architect Vladimir Osipovich Sherwood and unveiled on 3 (15) august 1897, becoming "the first medical monument in the city"1. 1. Dmitry A. Balalykin, The History of Russian Surgery: Selected Pages, LLC Publishing house "Practical Medicine", Moscow 2017, pp. 61-62.